Dashboards provide a one-stop shop to view all activity across your system for which log events are being sent to Loggly. Dashboards allow you to create visualizations of the results of your search queries based of your log data which may reveal issues and thereby assist you in identifying issues your customers may face. To access your dashboards, click on the Dashboard tab in the navigation menu. If you don’t have any open dashboards, you will see the manage dashboard screen as described below. Manage dashboard allows an Admin to quickly browse and manage all the dashboards in your account. You can find the Manage dashboard option on the top right of the Dashboard page. Search: The search box allows you to quickly find an existing dashboard you are looking for. You can also filter the dashboards by clicking on the All, Updated last 7 days or My dashboards. A dashboard name is unique to a given dashboard user. For example, Joe and Jill can each have a dashboard named “My Dashboard”. But Joe cannot have two dashboards named “My Dashboard”. Opening a dashboard: You can add any dashboard to the Dashboard tab by selecting the dashboard name from the list and clicking Open. To view the dashboard, click its tab. If you have previously hidden or closed any dashboard by clicking on the “x” on the dashboard tab, you can retrieve and display the dashboard from the Manage screen. You can also open multiple dashboards at once by selecting multiple checkboxes and clicking open. Delete dashboard: You can delete a one or more dashboards from the Manage dashboard page. To delete a dashboard select the dashboard from the list under the Manage dashboard by clicking on the checkmark for each dashboard that you want to delete (as shown below). Then click on the “Delete” button. If you are sure you want to delete the dashboards click OK to confirm this action in the pop up window. To create a new dashboard, click on the “+ New Dashboard” tab. A new tab will open. A new blank dashboard opens in Edit mode. You can add any number of charts to this dashboard by searching for and selecting the chart from the “Add existing chart” drop down. This dropdown lists all charts to which you have at least view permission. Once you have finished adding all the charts you want to this dashboard, click “save”. This will change your dashboard to “view” mode. To edit a dashboard, click “edit”. Rename: You can rename a dashboard by moving the cursor into the name field, clicking and editing the text. Hide: You can hide the dashboard by clicking on the x in the dashboard tab. You can view it again by selecting it from the Manage screen. 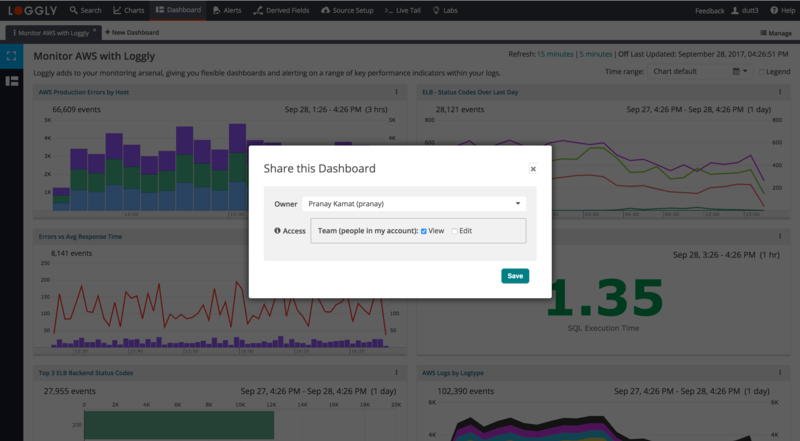 Dashboard permissions allow you to share and collaborate on a dashboard with other users in your account. Permissions are visible in the Edit Dashboard mode. Owner: Indicates which user within your account owns this dashboard. View: When the view checkbox is selected, anyone in your account can view the selected dashboard. Edit: When the edit checkbox is selected, anyone in your account is permitted to make changes to the dashboard. Edit permission also allows users to change the owner of the dashboard. Edit is only permissible when View is selected. Note: Admins have Edit permission to all dashboards for all users in the account. Hide Dashboard: Removes the dashboard tab from the Dashboard page. The dashboard remains accessible in Manage dashboards. Delete: Deletes the dashboard. The dashboard is no longer accessible in Manage dashboards. The individual charts within a dashboard also have an action icon. Clicking on the Action icon allows you to view and perform the following actions on any chart in the dashboard provided you have the required permissions. Clone: Creates a new chart and opens the chart in the Charts page. The new chart’s name will be prefixed with “Copy of” followed by the name of the cloned chart. Rename: Pops up a window in which to enter the new name of the chart. Copy chart link: Copy a unique permalink of the chart to the clipboard. You can share this link with other users who can click on the link to open the chart. Depending on the permissions for this chart, those users can view or edit the chart. Share chart: Opens the Permissions window where you can change owner or set view and edit permissions. Remove: Removes the chart from the dashboard. The chart remains accessible in the charts Library. Delete: Deletes the chart. The chart is no longer accessible in the Charts Library. You can choose the refresh interval for the charts in a dashboard. The two options are 5 minutes and 15 minutes. You can also choose to disable dashboard refresh. Once the refresh rate is selected, the “Last Updated” timestamp will be displayed as well. You can use the time range dropdown at the top right hand corner of the dashboard to do a one-click sync of the time ranges on all displayed charts on the dashboard. Note: This setting does not persist and will be reset when you leave the page. Check the box to show the Legend below the Charts as shown here. Please note, if your chart has many series, the size of the chart will be reduced to make room for each series label. This article applies to Dashboards in Loggly 3.0; for information about Dashboards in Loggly 2.0, please click here.